Also available as a gas/electric hybrid vehicle. Prices start at about $25,000. Hybrid fuel economy is 34/30 with FWD. 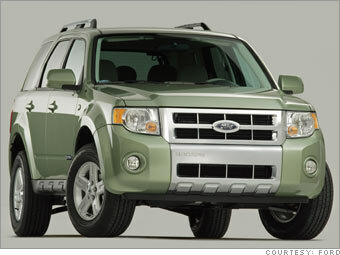 The Escape was already a decent small SUV before it was redesigned for the 2008 model year. Now it has a more controlled ride and more nimble handing. Inside and out, the new Escape looks sophisticated and masculine. It retains a traditional boxy shape that gives it a nice roomy feel inside. While the interior design is also outstanding, some cut-rate materials detract from the effect. Overall, the Escape is a wonderful crossover SUV for those who actually like SUVs.